The Rafale deal was done in 2012 when Manmohan Singh was still Prime Minister. The bidding process actually began in 2007. All the “side deals” would have been well structured at this time. The current Modi Government could only have taken over the “tributary mechanisms” of money flows from what was already structured by the previous government. Of course these would have been embellished a great deal. 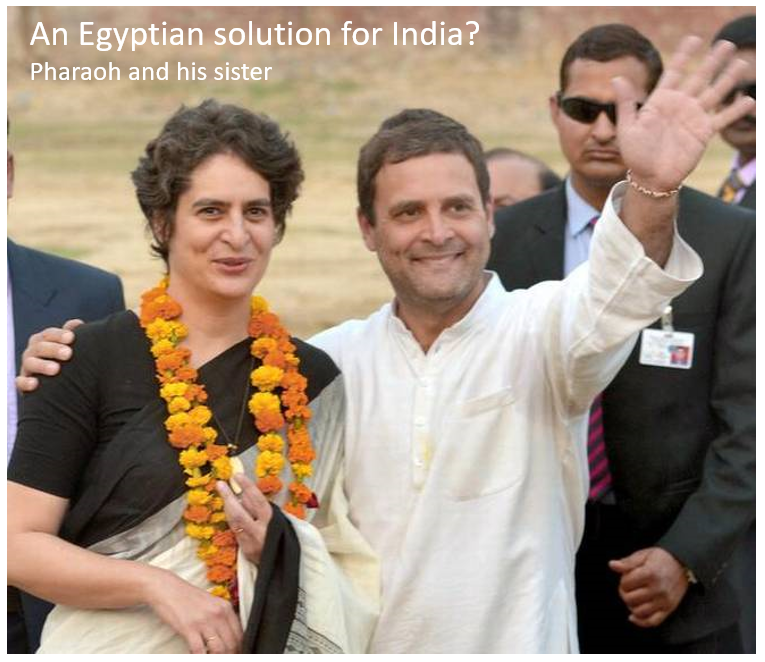 Rahul Gandhi, it would seem, is trying desperately to obliterate the personal Bofors stain. Finally the winner of the Indian MMRCA competition has been announced (or at least the L1 bidder) and it seems that the French dumped their prices for the Rafale to beat the Eurofighter by $4-5 million per aircraft. The performance of the Rafale in the Libyan adventure was also to its benefit compared to the Eurofighter Typhoon. Normally in the procurement process, the L1 bidder is called for final discussions to settle the contract and some further price negotiations can be expected. The contract will not be settled till the next fiscal year (after April 2012) and it would be very unusual for the evaluated L1 bidder not to get the contract. 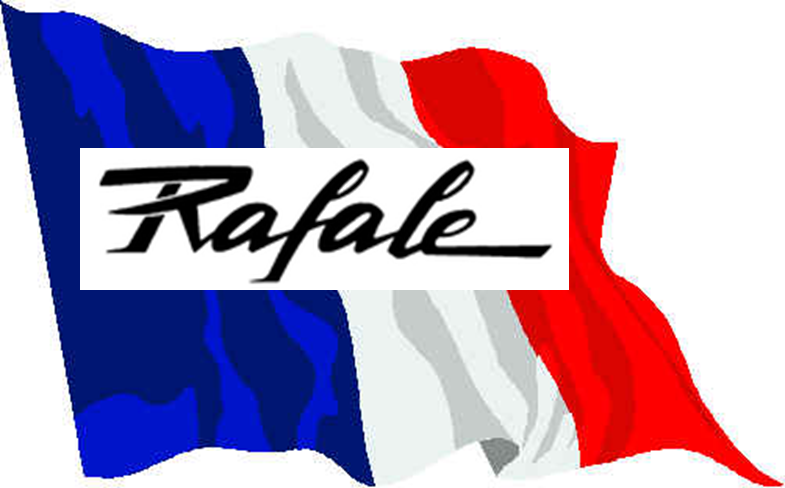 This contract is particularly important for Dassault since not only did the Rafale need a boost but also because they are guaranteed a market with the Indian Air Force for at least the next 15 years. There has been a demonisation of carbon dioxide which goes beyond the ridiculous. Atmospheric carbon dioxide concentration in the atmosphere lags temperature amd man-made carbon dioxide emissions are largely irrelevant to climate. Allied to the bloated hype about renewables, this has led to an anti-carbon imperialism which represents politically correct dogma. 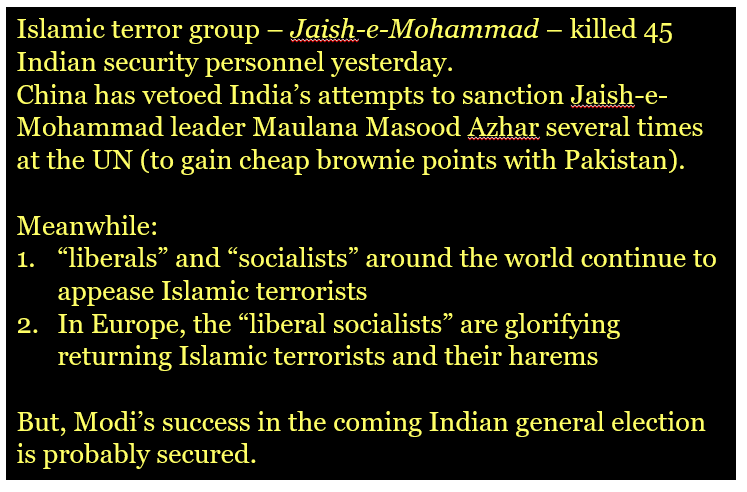 India has also been overwhelmed – in public – by the new religion. Of course India managed to ensure that domestic coal utilisation could be tripled while still complying with the sanctimonious, but meaningless, Paris agreement (note that China can double its coal consumption under the agreement). Publicly, however, it was not acceptable to admit reality. Fortunately, there are some signs of reality creeping back into the public energy utterances in India. The Chief Economic Adviser to the Government of India has confirmed the importance of coal and criticised the “carbon imperialism” that is being religiously disseminated. The hidden costs of renewables are not to be ignored. Coal will and should remain the primary source of energy for India in the short to medium term as the fossil fuel remains the cheapest source of energy for India’s development needs, chief economic advisor Arvind Subramanian said on Thursday. Renewable energy, on the other hand, comes with hidden costs, Subramanian said in a lecture organised by think tank The Energy and Resources Institute (TERI). Subramanian called for setting up a global coalition for clean coal technology, mirroring the international solar alliance, which could find ways of sustainable use of coal in power generation. “India needs coal in the short to medium term. Renewable sources must be part of the energy mix but they also come with hidden costs, which should not be overlooked in our headlong embrace with renewables,” said Subramanian. India cannot allow the narrative of “carbon imperialism” to come in the way of realistic, rational planning for the country’s energy future, he added. Subramanian’s call for caution in the adoption of renewable energy comes at a time when many state power utilities are forcing solar power developers to lower their power tariffs in a market where tariff discovered in subsequent auctions keep declining. Although the solar power tariff keeps declining due to a fall in imported solar panel costs, renewable power projects bear the extra cost of power storage equipment. However, industrial consumers, which bear cross-subsidy for domestic consumers, find solar power cost attractive. This leads to reduced capacity utilisation of coal-based thermal power plants, adding to the stress in the power sector. “Coal will remain and should remain. The time is ripe for creating a green and clean coal coalition mirroring the (international) solar alliance. That, rather than unconscionable calls to phase out India’s cheapest source of energy, will serve the cause of climate change and India’s development needs,” said Subramanian. The chief economic advisor also said that policy decisions on coal and renewable sources of energy have to be taken jointly as these two are connected. Declining prices of renewable energy is threatening to upend the thermal power sector as prices are renegotiated by distribution companies, which themselves are in stress, Subramanian said. This renegotiation could transfer the stress in the power distribution sector to the renewable energy sector. Railway minister Suresh Prabhu, who was present on the occasion, said the country’s energy policy was forward looking and was adequate to achieve overall economic growth as it captures the linkage between economy, environment and social development. India meets its Paris emissions commitments (which are measured per capita) not so much by reducing coal use but by increasing the proportion of nuclear and renewable stations. Between 2006 and 2016, 139 gigawatts of coal-fired capacity was brought on-line. A record 21 gigawatts of new coal capacity was built in 2015, and almost another 18 gigawatts in 2016. The planned construction of an additional 178 gigawatts would make it nearly impossible for India to meet its climate promises. By developing all of the planned coal-fired capacity, India would increase its coal generating capacity by 123 percent. The Indian budget will be presented today and the annual Indian Economic Survey (which forms the basis for the budget) is also out. The Economic Survey is the responsibility of the Chief Economic Adviser to the GoI (this year Arvind Subramanian). The budget itself is expected to be mildly expansionist (especially after the jolting brake applied to the economy by the demonetisation circus of the last few months). Certainly some black money was removed from the system but this may be a one-off affair. Certainly, from the anecdotes I hear, the generation of “new” black money has not been slow to start. Maybe demonetisation will have to become an annual affair – or a regular occurrence every so often. But, no doubt, India has made a step-change in the level of electronic transactions being used. It has also brought a huge number of people into the banking system. One of the main concerns for the government is that the cash economy has allowed so many to remain invisible and completely outside the tax base. Considering that only 7 of every hundred voters is even registered for tax, it was imperative for the government to reduce the huge number of the tax-invisible. This they probably have done. Indians on The Move – New estimates based on railway passenger traffic data reveal annual work-related migration of about 9 million people, almost double what the 2011 Census suggests. Biases in Perception – China’s credit rating was upgraded from A+ to AA- in December 2010 while India’s has remained unchanged at BBB-. From 2009 to 2015, China’s credit-to-GDP soared from about 142 percent to 205 percent and its growth decelerated. The contrast with India’s indicators is striking. New Evidence on Weak Targeting of Social Programs – Welfare spending in India suffers from misallocation: as the pair of charts show, the districts with the most poor (in red on the left) are the ones that suffer from the greatest shortfall of funds (in red on the right) in social programs. The districts accounting for the poorest 40% receive 29% of the total funding. Political Democracy but Fiscal Democracy? – India has 7 taxpayers for every 100 voters ranking us 13th amongst 18 of our democratic G-20 peers. India’s Distinctive Demographic Dividend – India’s share of working age to non-working age population will peak later and at a lower level than that for other countries but last longer. The peak of the growth boost due to the demographic dividend is fast approaching, with peninsular states peaking soon and the hinterland states peaking much later. 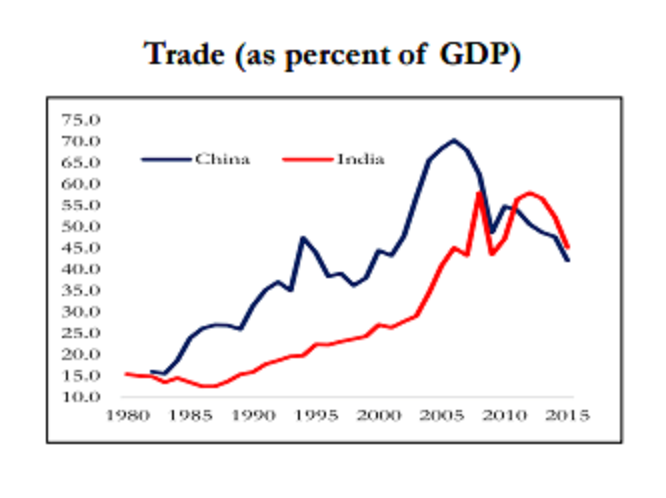 India Trades More Than China and a Lot Within Itself – As of 2011, India’s openness – measured as the ratio of trade in goods and services to GDP has far overtaken China’s, a country famed for using trade as an engine of growth. India’s internal trade to GDP is also comparable to that of other large countries and very different from the caricature of a barrier-riddled economy. 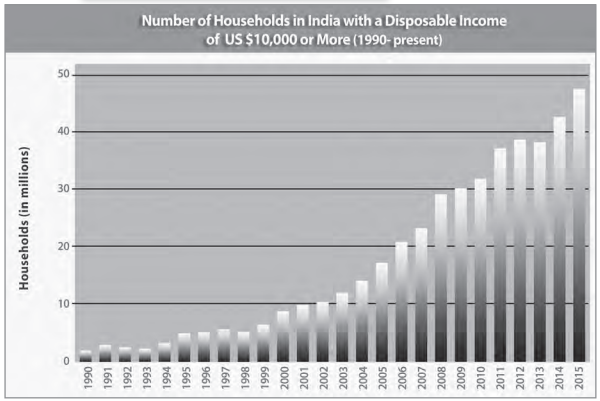 Divergence within India, Big Time – Spatial dispersion in income is still rising in India in the last decade (2004-14), unlike the rest of the world and even China. That is, despite more porous borders within India than between countries internationally, the forces of “convergence” have been elusive. Property Tax Potential Unexploited – Evidence from satellite data indicates that Bengaluru and Jaipur collect only between 5% to 20% of their potential property taxes. The two Indian medal winners surely deserve all the celebration and adulation they are now receiving. They have overcome corruption and incompetence and indifference that is endemic of the state government and sports organisation in every sport except cricket. To participate in the Olympics is itself a battle won for individual athletes. But 2 medals (one silver and one bronze) from a population of 1.2 billion is a shameful indictment of the organisation and administration of sports. The difference between India and China is stark. 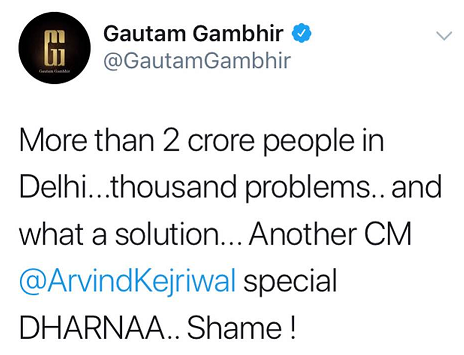 Sports Ministers in every State are pathetic. Sporting associations are riddled with incompetence and nepotism and corruption. Winning medals wins no votes. Half of the Indian monsoon season is over and “so far so good”. 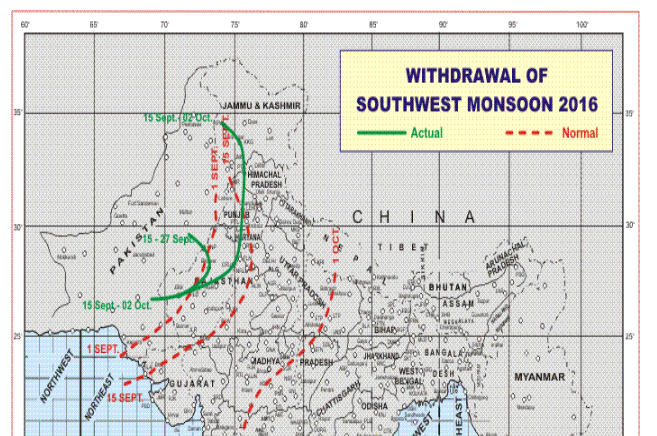 There is a good probability that 2016 is going to have a “good” monsoon. A uniform rainfall over the entire country and an excess rainfall of over 5% from the long term average and less than 15% in excess of the LTA is most desirable. (More than 15% excess will almost certainly give some very serious flooding, while less than 5% excess would probably leave some parts of the country dangerously dry). The El Niño is clearly over and weak La Niña conditions are developing. If La Niña conditions continue to develop, and are established before the end of the year, then there is a good probability that India will even have a good monsson during 2017. 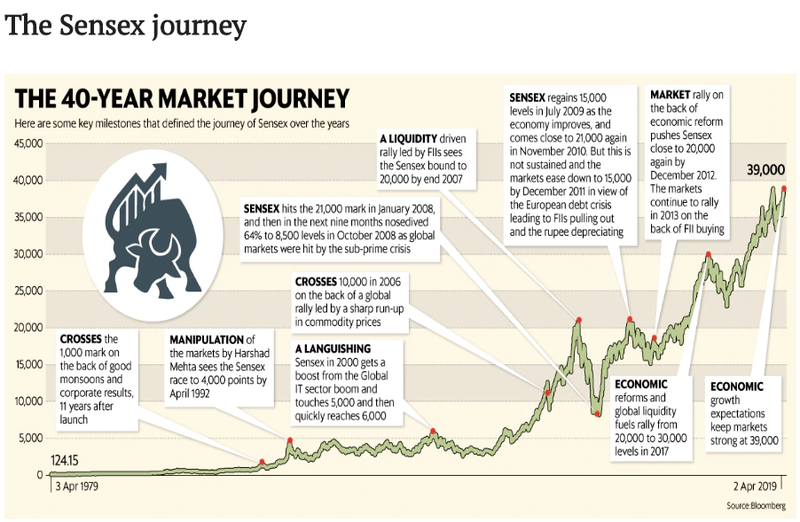 The harbingers for an extended period of good growth in India look promising. There is an increasing possibility of a hard winter ahead in Europe. In Sweden, autumn seems to have come early and it could be a long, cold winter. Rainfall over the country as a whole for the 2016 southwest monsoon season (June to September) is most likely to be ABOVE NORMAL (>104% to 110% of long period average (LPA)). Quantitatively, monsoon season rainfall for the country as a whole is likely to be 106% of the long period average with a model error of ±4%. Region wise, the season rainfall is likely to be 108% of LPA over North-West India, 113% of LPA over Central India, 113% of LPA over South Peninsula and 94% of LPA over North-East India all with a model error of ± 8 %. 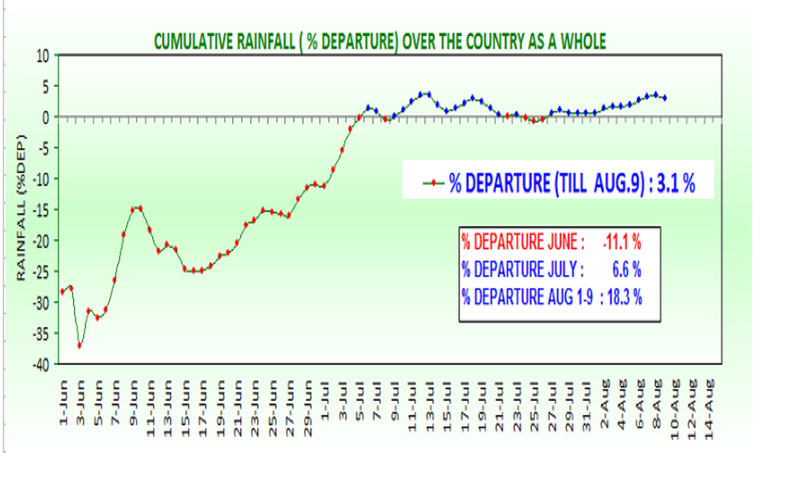 The monthly rainfall over the country as whole is likely to be 107% of its LPA during July and 104% of LPA during August both with a model error of ± 9 %. The El Niño conditions over the equatorial Pacific prevailing since April, 2015 reached to strong level in July, peaked in December 2015 and started declining thereafter. The rapidly declining El Nino conditions became moderate in early April 2016, weak in early May and now have turned to neutral ENSO conditions. Recent changes in the atmospheric conditions over the Pacific also reflect the weakening El Niño conditions. Latest forecast from IMD-IITM coupled model indicate ENSO neutral conditions are likely to continue and turn to weak La Nina conditions in the latter part of the monsoon season. There is about 50% probability of La Nina conditions to establish during the monsoon season. Most of the other models also suggest development of La Niña conditions during the latter part of the monsoon season. Over Indian Ocean, the sea surface temperatures are warmer than normal over most parts except along the coast off central and south Africa. Currently neutral Indian Ocean Dipole (IOD) conditions are prevailing. The latest forecast from IMD-IITM coupled model indicates positive IOD conditions are most likely during early part of the monsoon season and same to turn to negative IOD during the latter part of the monsoon season. 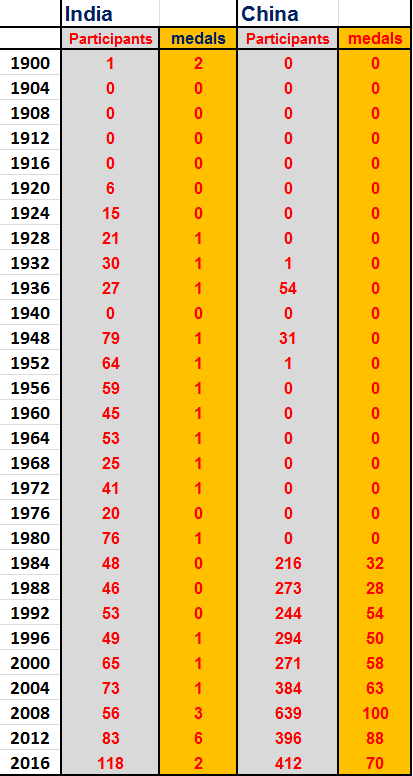 The monsoon season is half over and the rains are at the long-term average which is considered “good”. The difference between a “good” and a “poor” monsoon is generally thought to be over 2 percentage points for GDP. The Indian ratings agency CRISIL is sufficiently encouraged already to begin talking about a GDP growth of over 8% for the Fiscal Year ending March 2017.
moneycontrol:A good monsoon with even rainfall distribution across regions will give a boost to farm sector and may push India’s GDP growth beyond the 8 percent mark in the current fiscal, Crisil said. However, stress in rainfall in certain parts of the country and excess downpour in some other regions may be a cause for worry, the credit rating agency said in a report. In a positive scenario — good monsoon backed by favourable temporal and spatial distribution — agriculture growth can surge to 6 percent from a weak base of last year and therefore push up GDP growth above 8 percent, it said. According to the report, assuming rainfall is evenly distributed across time and regions, GDP growth may rise to 7.9 percent, if agricultural growth comes at 4 percent and CPI inflation remains contained at 5 percent in the current fiscal. ….. Despite a slow start in June, rains have caught up and were just 1 percent below normal as of July 25. This has helped reservoirs to bounce back from the lows seen in the beginning of the fiscal, boosting farmers’ confidence, the report said. Excess rainfall in 89 districts across eight states could impact sowing and therefore agricultural output for the kharif season. Hence, spatial and temporal distribution of rainfall in the second half of the season, especially in August, will be crucial, it added. Today’s picture from Skymet shows the monsoon covering the entire country reasonably evenly.